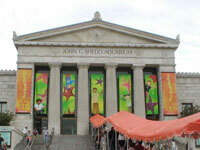 One of Chicago's best known attractions, the Shedd, opened in 1930, remains one of the world's largest indoor aquariums. The octagonal marble building houses more than 8,000 river, lake, and sea creatures. The main attraction is the Caribbean Coral Reef exhibit and other marine habitat exhibits like a recreation of the Amazon basin and a 'Seahorse Symphony'. Animals in the Shedd include otters, penguins, whales, sharks, sea turtles and much more. The aquarium also features an indoor saltwater Oceanarium housing marine mammals, where dolphin shows are scheduled daily. Opening times: Hours vary by season; generally 9am-6pm. Check website for detailed calendar. Admission: General admission: $40 (adults), $20 (children aged 3-11). Special deals are available on the official website.